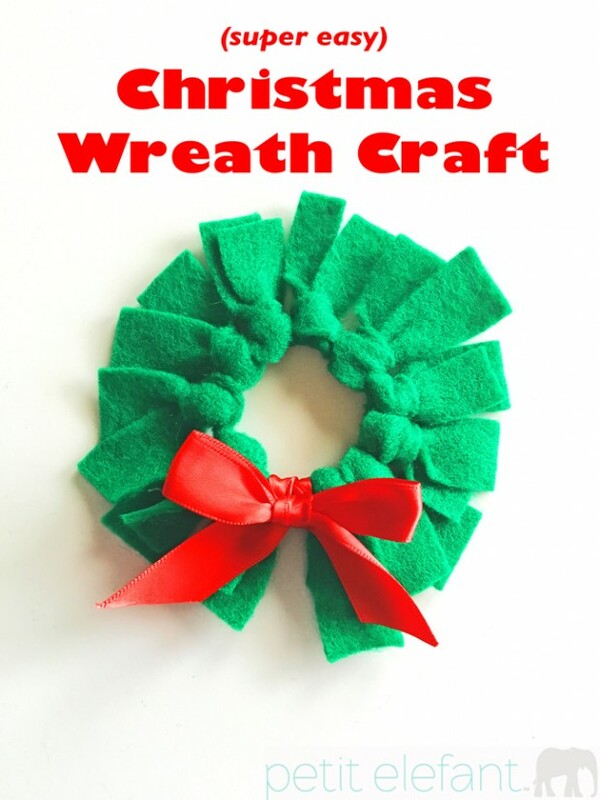 This adorable little Christmas wreath craft is possibly the easiest Christmas craft ever. 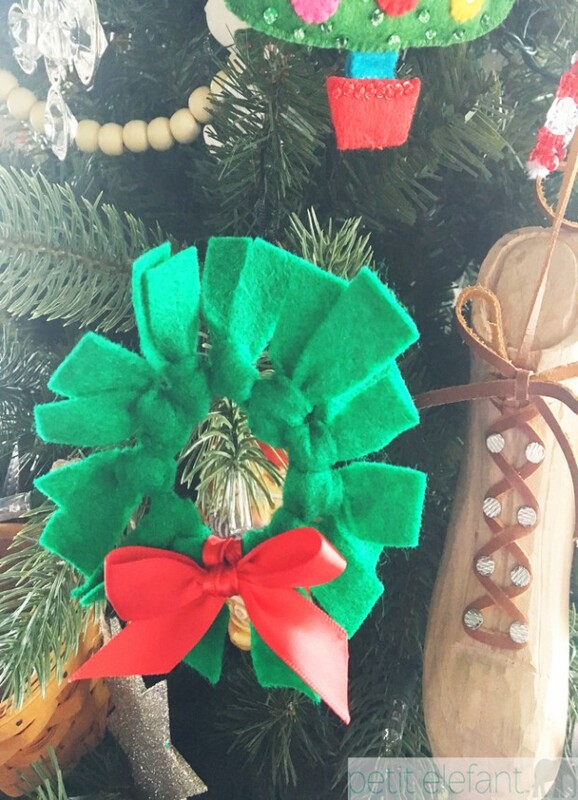 It requires only 3 supplies and a pair of scissors, and is not only cute and festive, but it’s great for kids. Um, hello, room moms in charge of class Christmas parties? This is perfect. It’s low cost, low maintenance, and doesn’t involve any glue, glitter or paint. Hallelujah. Cut your pipe cleaners in half and form them into circles, twisting the ends over. You can also use full length pipe cleaners to save a step, but you’ll have more excess on the ends to twist over–a 2-3 inch circle is just about right. 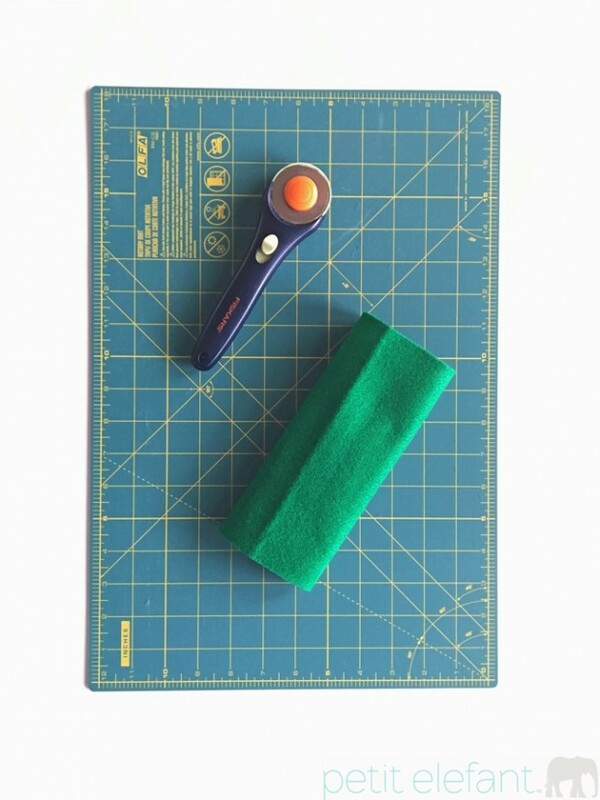 Cut your felt into strips, 4 inches-5 inches long by about 3/4 inch thick. A little wider or narrower won’t matter at all. Closer to 5 inches makes them a smidge easier for little hands to manipulate, and they can always be trimmed off the finished product. Estimate about 12-15 strips per wreath. 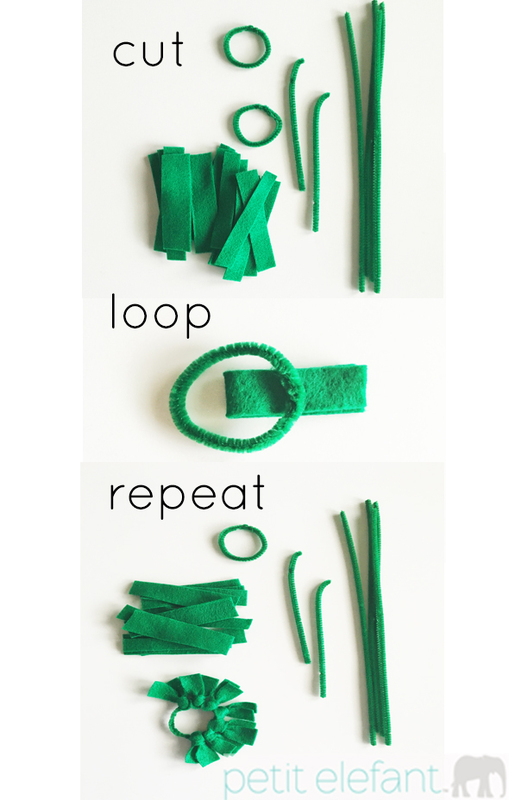 Begin looping your strips of felt over the pipe cleaner circles by folding the strip in half, placing the loop end beneath and in the center of the circle. Fold both the loop end and loose ends up and pull the ends through the loop. Give a gentle tug or two for a snug fit. You’ll notice one side of the wreath will be bumpy, the other will be more smooth. Don’t worry if your circle gets a little misshapen, it’s easy to fluff back up when you’re done. Repeat around the entire circle. 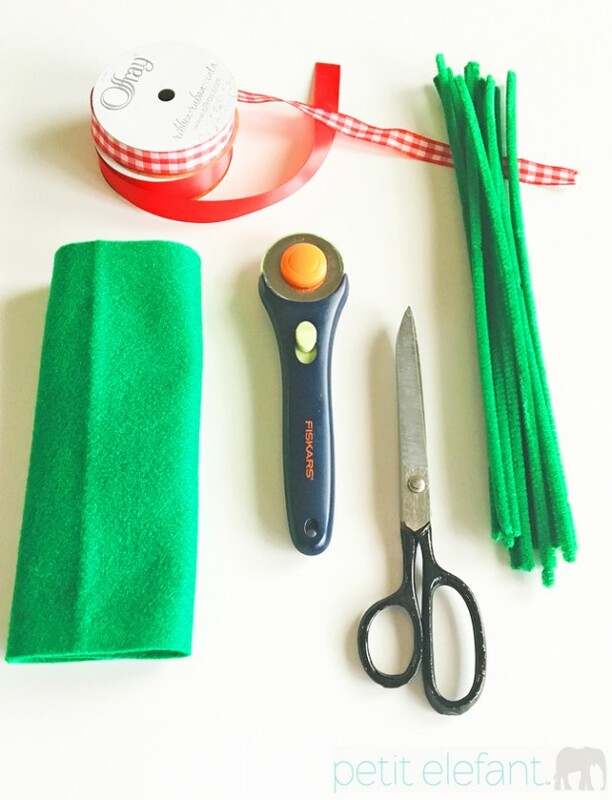 For a fuller, fluffier looking wreath, gently scrunch your knots closer together as you go, making room for a few more lengths of felt. Finish with a ribbon–simply looped in the same fashion as your felt, or tied in a bow. Short tails or long tails, it doesn’t matter. Whatever pleases you best. That’s it! 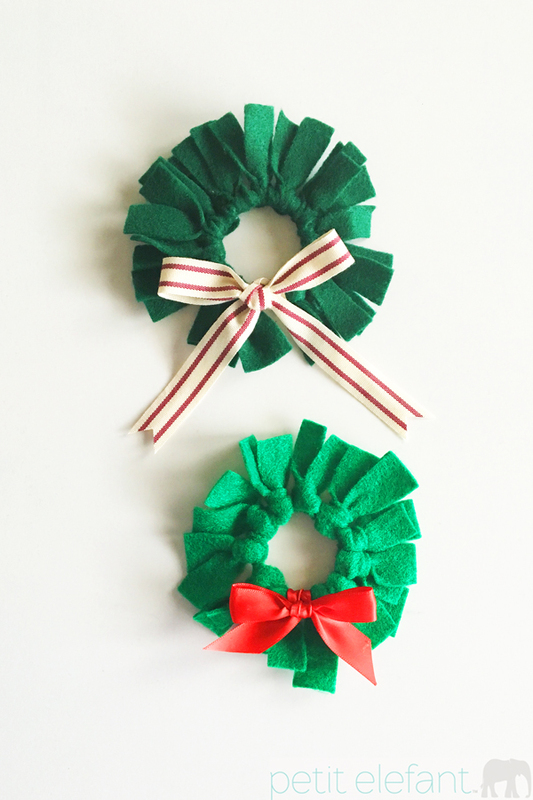 The genius of these little wreaths is that a bit of imperfection adds character and dimension, making them a great craft for school age kids. These could also be adorable done up with green loops of ribbon or patterned fabric instead of felt, don’t you think? Or in non-traditional Christmas colors like hot pink, lime green, turquoise. They make darling ornaments on a tree, but also work well tied to gifts or strung in groups as part of a festive vignette. We’d love to see how yours turn out!